Nothing about Sun Ra's six-decade musical career could be called normal. He recorded somewhere around 200 albums, although no one knows for sure. He toured the world, was revered in Europe, and staged at least three 100 piece concerts, one at the pyramids in Egypt. He was the subject of several films, pioneered the use of electronic keyboards like Moog synthesizers, created his own independent record label, and influenced countless jazz and rock musicians. His pronouncements were drenched in his unique cosmic mysticism, and his band members claimed he had telepathic powers. Most importantly, he made music, as he wrote, "rushing forth like a fiery law." 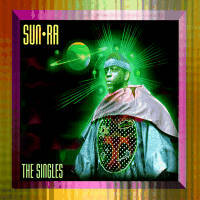 Sun Ra claimed that he was sent to earth from outer space to save humanity and bring harmony to the world. If you were lucky enough to catch Sun Ra's live show before he died in 1993, you probably believed him. Mr. Ra came from the tradition of vaudeville, swing, and Chicago show clubs. He was also deeply spiritual, and his live shows encompassed all of these elements. They were several hour ritualistic ceremonies featuring a hot orchestra of a dozen or more (referred to as the "Arkestra"), poetry, light shows, dancers, marches through the audience, and squealing sax solos. Sometimes the band members would take the stage to the chant of "Heigh-ho, heigh ho, it's off to work we go." Most shows included a long percussion jam with the horn players switching to persussion instruments, many of them homemade. If he was in the mood, Ra would take a synthesizer solo that inevitably erupted in a volcanic crescendo. The Arkestra members wore colorful, glistening outfits that were a combination of African tribesman garb and outer space suits. 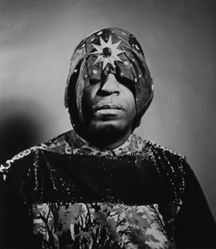 As was appropriate for a high priest, Sun Ra usually wore the most outrageous outfit, with a headdress and flowing cloak. Jerry Gordon, who co-owns Evidence Music, which has re-issued twenty early Sun Ra albums on CD, remembers being overwhelmed by the first Sun Ra show he saw in the early 70s. "It was an incredible concert," he says. "It was music like I had never heard before. Ra and the dancers were wearing capes. Fans on the floor blew the capes so they looked like multicolored wings. They had a spiral light on John Gilmore during his solos that created a tunnel effect. Ra was also using lights to make it look like he was sticking his head in a black hole in space. It was just unbelievable. I considered it holy music, music people should hear." If you didn't get a chance to see Sun Ra perform, you should seek out Space is the Place, an early 70s movie starring the jazz master from Saturn himself. Ra floats about in a rocket ship propelled by his music and does battle with the FBI, NASA, and other supernatural bad guys. The movie has a cosmic humor, and like Sun Ra it is at times fascinating, indecipherable, and absurd. The Arkestra makes several appearances in the film in full regalia, and the soundtrack, also re-issued by Evidence, is full of ferocious full-orchestra jams. Horn, percussion, and synthesizer freakouts move in and out like waves of turbulence on sixteen tracks of Sun Ra favorites. Sun Ra was born Herman P. Blount on May 22, 1914, in Birmingham, Alabama. His father left the family when he was a child, and he was raised mostly by his aunt and grandmother. 'Sonny,' as he was nicknamed, received a piano for his seventh birthday, and with little musical training, taught himself to read music. He formed his own band in high school, and an associate from those days recalls that back then Sonny was able "to get different rhythms and peculiar notes." Sonny went to Alabama A&M on a scholarship, where he led the student band. He would transcribe the popular swing band tunes from the radio and soon have his band playing them. While in college, an incident took place that transformed his life. He claimed that he had been transported into a spaceship by aliens, who informed him of his higher calling. He dropped out of college and, for several years leading up to World War II, played throughout the South with various Birmingham-based bands. He had to play behind a curtain in certain southern clubs because the white patrons objected to the sight of black musicians. It was during this time that Blount developed a rehearsal style that he would use the rest of his life: he turned his living quarters into a rehearsal and recording studio and practiced virtually around the clock. He also recruited a cadre of musicians--not quite a 'band' because they performed in public very infrequently--and gave them free music lessons if they were willing to show up at his house on short notice and try out his arrangements. During World War II, Sonny Blount was jailed for being a conscientious objector. He was so engrossed in music and his research in ancient black cultures and so adverse to violence, that fighting in a war was inconceivable to him. He left Birmingham for good after the war and moved to Chicago, a jazz hotbed. He was soon hired as the practice pianist at the popular and glamorous Club DeLisa, which had show girls, comedians, singers, and floor shows. At the DeLisa he got to work with his idol, Fletcher Henderson, one of the originators of the swing sound. Even in the '40s other musicians spoke of the strangeness of the music he played. Erskine Hawkins said of Blount in the '40s, "Sun Ra would go into chords that nowadays are pretty common but back then were in another world." He was nicknamed "Moon Man" for his spacey lingo and far-out music, although he went by the stage name of Sonny Lee. In the early '50s, he formed small groups that played mostly be-bop and standards. He slowly increased the number of musicians in his combo. Some of them were still in high school. As trumpeter Phil Cohran explains, "He had a lot of trouble with the so-called good musicians. He became successful when he started training young guys." John Gilmore, the band's tenor saxophone mainstay for the next four decades, joined Le Sony'r Ra, as he was known then, in 1953 after a stint in the Army. Pat Patrick and Marshall Allen, sax players who would work with Sun Ra for decades, also joined up during this early period. By the mid-'50s, he had dubbed himself Sun Ra, and the band, which had grown to a dozen players, was known as his 'Arkestra.' In 1956, he established Saturn Records to produce and distribute his records. This was an extremely creative period for Ra, who would write new material constantly and sleep very little. His band practiced, recorded, and played virtually every day. After a few years, Ra had whipped the outfit into a tight, focused, swingin' machine. It was an eccentric ensemble that could swing or play exotic mood pieces. By the late '50s, Ra was incorporating odd instruments into the Arkestra's sound, like zithers, timbales, chimes, claves, all kinds of bells and gongs, and things with names like "solar drum," "space lute," and "boom bam." He also had the Arkestra wearing space costumes, like helmets with flashing lights and propellers. Some of the early costumes were hand-me-downs from a Chicago opera company. The Arkestra's sound was becoming increasingly abstract. Ra was experimenting with pieces that dealt more with sound coloring and texture than structure. He was also utilizing African rhythms with multiple percussionists, which was unusual for the late '50s. In 1961, the Arkestra moved to Montreal briefly and, following a series of aborted gigs, then to New York. By that time, only Gilmore, Allen, and bassist Ronnie Boykins remained with the Arkestra. Within a few years, Ra built the ensemble back up to full strength with New York musicians and began to attract attention. He was part of the "free jazz" revolution taking place in Greenwich Village in the '60s along with John Coltrane, Albert Ayler, Cecil Taylor, and others. "As we started adding New York musicians, we started moving to the avant-garde," said John Gilmore. "That was right in our bag, and we were ready for it because Sun Ra had trained us in Chicago, playing half tones and quarter tones, stuff like that." By the mid-'60s, Sun Ra and the Arkestra weren't just visiting deep space; it was their permanent residence. The music had become an otherworldly mix of atonal, aberrant, sounds and effects. Sun Ra had transformed his eccentric big band of hard bop soloists into a experimental open-improvisation ensemble. Ra was becoming "the philosopher-king of Afro-psychedelia," as writer Michael Shore put it. Ra's music of this period was typified by counter melodies, off-key horn barrages, polyrhythms, titanic organ and synthesizer solos, and dissonant note clusters. The works were getting longer and the solos more stretched-out. A piece might be in several different keys, in no key at all, or in Ra's so-called "space key." When he was charged with being too eccentric, Ra pushed himself even further into the void. Despite the pioneering far-outness, Sun Ra objected to the term "free" jazz. His pieces weren't free. They were carefully crafted, structured works. The Arkestra was known by a variety of names including the Solar Myth Arkestra, Cosmo Jet Set Arkestra, Myth-Science Arkestra, Intergalactic Research Arkestra, and Astro-Intergalactic Infinity Arkestra. The pay was usually so low that many of the musicians played outside gigs with other bands. In late 1968, Ra moved the Arkestra to Philadelphia. "To save the planet, I had to go to the worst spot on Earth," he later explained, "and that was Philadelphia, which is death's headquarters." Actually, the Arkestra was faced with eviction from the house it rented in the Lower East Side, so the band relocated when Marshall Allen's mother offered them a rowhouse in the Germantown section of the city. "We didn't have anywhere else to go," Gilmore said. In the late '60s, vocalist and dancer June Tyson joined the arkestra. Ra had decided to spread his message through lyrics as well as music, and Tyson fit the Arkestra perfectly in spirit and style. She eventually became Sun Ra's foil, confidently espousing Ra's puzzling ideology. She said that when she was on stage singing Sun Ra's lyrics, she thought of herself as a celestial being. During the next few years, Ra and the Arkestra traveled several times to California. In 1971, Ra taught a course at Berkeley called "The Black Man in the Cosmos." Few students took the course, although large numbers of Oakland residents attended. The reading list included the Egyptian Book of the Dead, the Bible, and books on hieroglyphics. Ra also spent part of each class playing the keyboards. He responded to the puzzled students' questions with a riddle or a knowing smile. He was never paid for the course. Impulse, a division of ABC, released a handful of Sun Ra LPs in the '70s. These releases gave him wide distribution and international exposure for the first time. 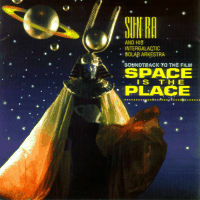 As Sun Ra's reputation grew, he and the Arkestra, which at times grew to thirty members, toured extensively especially in Europe. They even visited Egypt for a spiritual vacation and concert. Gilmore calls the visit to the pyramids, "The most beautiful experience I had on this earth. It made everything worthwhile." Like many jazz musicians, Ra received much more acclaim in Europe than in the U.S. Unfortunately, the European tours usually generated no more income than was necessary for expenses. Gilmore remembered the Arkestra returning from a European tour with nothing more than pocket change. "It was rough at pay time with all those guys in the band," he said, "but that's what Sun Ra always wanted, that big sound." Hundreds of musicians came through the Arkestra over the years, some lasting only a few gigs and some, like saxophonist John Gilmore, lasting decades. But being in the Arkestra was a difficult way of life. The band members never made much money, and Ra demanded discipline and hard work. He banned drugs, alcohol, and women, and band members had to be available for practice around-the-clock. Despite these inconveniences and Ra's many idiosyncrasies, virtually all of the musicians who came through Sun Ra's Arkestra attest to how much they learned from him. When asked why he stayed with Sun Ra for forty years, John Gilmore remarked, "He was the first one to introduce me to the higher forms of music, past what Bird and Monk were doing. It's unbelievable that anyone could write meaner intervals than those guys, but he did. When I realized that, I said, 'Well, I guess I'll make this the stop.'" Gilmore almost left Sun Ra in the '50s but changed his mind. "I learned more from Sun Ra in my first nine months with him than I had my whole life, not only in music but in philosophy and life in general. He elevated my whole scene. He changed my life." During his 40-year recording career, Sun Ra released well over 100 self-produced records on Saturn and distributed them at his gigs and a few choice record stores. They were usually packaged in white sleeves with wild homemade cover art. The Saturn records were full of discrepancies that Ra seemed to enjoy. "Some of the records he had recorded in 1956, '57, or '58, and didn't come out until, say, 1965," says Gordon, who sold Sun Ra's records at Third Street Jazz & Rock in Philadelphia. "Stuff from three different years and three different sessions would appear on a record. Almost always the records listed the wrong personnel. Some had no titles, no dates, no documentation. Everything to do with his label was confused, and I believe it was intentionally confused. He'd bring in a Saturn record, I'd sell out of it, but I could never get it back because he'd pressed a different album already. Some of them had no title, just a psychedelic design on the cover." By far, the oddest element to Sun Ra's career was his eccentric philosophy. He always appeared in an outer space costume and never relinquished his odd ideology, going space-bound whenever it suited his purpose. "I'm a spirit master," he said. "I've been to a zone where there is no air, no light, no sound, no life, no death, nothing. There's five billion people on this planet, all out of tune. I've got to raise their consciousness, tell them about the wonderful potential to bypass death." He claimed that cars and rocket ships would one day run on music, presumably his music. He refused to reveal much about his past. "That's his-story," he'd say. "My story is a my-stery." With his soft monotone voice, he gave the impression of a musical Buddha, speaking in riddles and contradictions at every opportunity. "People loved to question Sun Ra about being born on Saturn, but these things were said to bring people out of their normal, humdrum, everyday reality," says Gordon. "It's not about whether he's telling the truth. He tried to express his vision and get people out of the shadow world with his music. He was an educator and philosopher who tried to enlighten people." 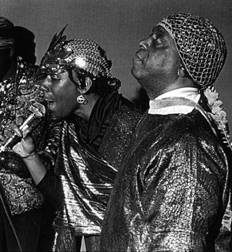 Sun Ra's mysticism was based on faith in a better world elsewhere. "Somewhere in the other side of nowhere is a place in space beyond time where the Gods of mythology dwell," Mr. Ra said. "These gods dwell in their mythocracies as opposed to your theocracies, democracies, and monocracies. They dwell in a magic world. These Gods can even offer you immortality." Ra confused and confounded the mainstream jazz world, and he found little acceptance or recognition there. Purists ignored him as an eccentric kook, and many jazz critics found his idiosyncrasies annoying. He was the antithesis of slick, smooth, high-profile, commercially-acceptable jazz musician. He simply refused to compromise and preferred to operate as a cult figure outside the jazz establishment. "A lot of people never got past the costumes and the mysticism," says Gordon, "but Sun Ra was a genius and was not nearly as popular as he should've been. You could put out a college kid doing the music of Sun Ra, and it would probably sell better than Sun Ra." Near the end of his life, Ra complained about the lack of acceptance and recognition he received in this country. He was especially bitter about Philadelphia. "The city has insulted me," he said in 1988. "I've been in this city long enough to be respected. There's a conspiracy, not by the government, I don't know who, to keep my music down." In the late '80s and early '90s, Sun Ra did garner national recognition. The alternative rock world embraced him as a major influence. The Arkestra played a gig on Saturday Night Live and jammed in Central Park with Sonic Youth. Robert Mugge made an excellent documentary about him and his space age theology called Sun Ra, A Joyful Noise. He was honored with the Liberty Bowl award from the city of Philadelphia and was voted the top big band in a Downbeat magazine critic's poll. And for the first time, he released two recordings on a major label-A&M. However, Sun Ra suffered a stroke in October 1992 and returned to his native Birmingham for medical care. (Ever the cosmic jester, when he was admitted to the hospital he listed his address as "Saturn.") On May 30, 1993, the spirit master from outer space left this world. He was 80 years old. All of Sun Ra's music was steeped in the past but was simultaneously pioneering. He used tradition not to repeat but to take the music somewhere new. Whatever the style, his music always challenged the listener. "Sun Ra's music didn't need any explanation," says Jerry Gordon. "Once you stopped trying to intellectualize it and just gave yourself to it, the music was self-evident. You can't look for secrets of the universe in it. You understand Sun Ra only by listening to the arkestra and abandoning yourself to the music." Lists at least 18 Sun Ra pages and sites, including this article. You can vote on the sites and leave comments.